You'll fish Tennessee's Kentucky Lake in the Paris Landing State Park sector, located near Paris, Tennessee! Steve has been guiding anglers here for 37 years during the spring, summer and fall seasons. From educational tips on finding and catching fish to a fun filled day of southern hospitality, you'll leave with a big smile. Got questions about how to read your LCR, lake maps, or finding fish in deep water? Maybe techniques or understanding habits of fish on your own home lakes is on your mind? Chances are, you'll leave a better fisherman after a day or two on the water here. A trip consists of 7 to 8 hours of fishing with a mid-day break for lunch. Boat, motor, gas, tackle, life vests, etc....are furnished when crappie fishing. Party size can range up to three (3) people. Costs are $335 for two; $385 for three, plus bait and ice. A 50% or one day deposit is required to reserve multiple dates. For bass fishing the party size is limited to two (2) people and clients are responsible for their own tackle and fuel used during the trip. Boats are safe and comfortable. Large groups can also be accommodated. You'll want to pack along raingear, soft drinks, ample clothes, sunglasses, and a cooler to take your fish home. Fish cleaning facilities and freezing is available at the dock or you can hire your catch filleted and bagged by attendants at the marina. Party size can range up to three (3) people. Costs are $335 for two; $385 for three, plus bait and ice. A 50% deposit is required for ALL dates booked. A 30-day cancellation notice is required. After that deposit is void. Resident annual Jr. Hunt/Fish (13-15) - $8. Adults can obtain a 1-day tag for $5.50; annual for $28. Purchase your license online by going to www.tnwildlife.org. There is a processing fee by the state's vendor for online purchases. Also available at local convenience stores/resorts in the area. The best time to go fishing is whenever you can! However, here's a month by month summary that will help you plan your trip here to Tennessee's Kentucky Lake. NOTE: For the last few years my most consistent months of stable weather for catching crappie have been June and the fall months of Sept/Oct.!!! MARCH...The first half of the month finds crappie still in a winter pattern and relating to the deep ledges of the main lake in depths zones of 15 to 25 feet. Bottom bumping rigs are used to stalk the submerged stump rows and creek channels where some hefty, prespawn crappie reside. 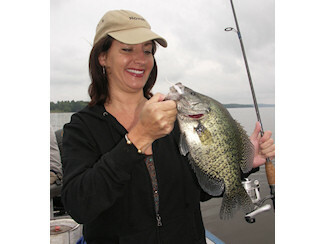 By the middle of the month, crappie begin moving into secondary bays in a prespawn pattern using depths of 6 to 12 feet. I start out the month fishing deep ledges and creek channels but finish up working my manmade fish attractors such as brushpiles/stakebeds in 12 foot depths and less. Bass activity in March is good, especially in the last half of the month when surface temps warm into the low to mid-50's. Crankbaits, jigs and spinnerbaits are the normal lure selections fished around big rock banks and some shallow stumps. Some of the largest bass of the year are taken in late March as the fish put on a feed bag. Bass fishing is good in late March. APRIL...is the prime month of the year for crappie as spawning occurs when water temps reach the 62-66 degree range. This means fish move up seeking shallow habitat to spawn such as 2 to 8 foot zones where cover is found. Casting grubs, vertical presentations of jigs in and around manmade structure, live minnows under slip bobbers and trolling are the popular methods. Weather is a factor and spring is always unpredictable so dress warm. Bass activity in April is good as the fish are in prespawn and waiting for warmer weather and higher lake levels to inundate shoreline grass beds and wooded cover. The first half of the month means crankbaits on gravel and spinnerbaits around wood with some topwater action too, if the weather is warm. The second half of the month sees water beginning to enter visible shoreline cover such as bushes and willows where worms, lizards, surface lures and others come into play. MAY...is a good month for bass and bluegill activity as both species are on the bed. Excellent action on bass in the weedbeds on topwater as well as pitching and flipping jigs/lizards around buck brush. The water on Kentucky Lake is at summer pool and shoreline habitat is abundant where bass spawn. Bluegill/shellcracker are on the bed and provide excellent opportunities to find them in big numbers as they fan the sandy, gravel areas where they spawn. Fishing light tackle with crickets or artificial grubs means some fast fun. This is the peak time for bluegill/shellcracker bed fishing with ultralight. Crappie are somewhat scattered in May as they are in the post-spawn phase but can still be taken in decent numbers over midrange depths of 8 to 12 feet. JUNE...sees crappie begin returning to the deeper ledges and manmade fish attractors in the 8 to 15 foot range. The fish begin to school again after being scattered back in May. June is a good time to catch crappie here. Often overlooked and underrated, it's one of my better months. Bass fishing is good, especially on the ledges and submerged creeks channels. Techniques such as Texas and Carolina rigged worms worked on the ledges work good as do big deep diving crankbaits and jig/pig combos. It's a good time to find some big bass in one spot. June is one of my favorite months for bass. JULY/AUGUST...sees the crappie in their summer pattern and schooled on the deep ledges in depths of 15 to 22 feet. Both jigs and live minnows work well when vertical presentations with double hook bottom bumping rigs put the bait right on the stumps and in front of the fish. This is a good time to catch summer crappie which school in the deep water. White bass (stripes) are at a peak in August and some excellent action is to be had when surface feeding frenzies occur. The white bass are in the "jumps" at this time of the year and provide fast action that's second to none. Small spinners and surface lures are cast into the jumps. Bass fishing is good on the deep ledges much in the same manner as June. July is a good bass month. Catfishing action is good on the main river channel using nightcrawlers, catalpa worms and assorted commercial baits. Depths of 15 to 25 feet are common, especially when there's existing current in the river that seems to stimulate baitfish activity and increases the bite from hefty catfish. This is an excellent time to catch catfish. SEPTEMBER...sees a fall pattern begin for crappie as the fish migrate from the deep water back into the secondary flats and big bays. Depths of 6 to 12 feet are productive as the crappie follow their forage (shad) into the cooling waters. This is a good time to catch crappie and the weather is nice and predictable. Bass action heats up on the shallow gravel banks in early morning and late afternoon when bass chase the shad. Surface action and crankbaits work good. Also spinnerbaits tossed around shallow stumps and exposed cover produce too. This is a good bass month. OCTOBER...is a good month for crappie. It's one of the most underrated months of the year as stable weather, calm winds and beautiful landscapes make this a great time to be on the lake. Cool mornings and warm afternoons. The crappie are aggressive and hit good in the 4 to 10 foot zones on both jigs and live minnows. I highly recommend this month for crappie. Bass fishing in October is good as shallow water action means good topwater in early morning, late afternoon. Crankbaits on gravel and around shallow stump rows and logs produce some dandy fish. October is a good bass month here as stable lake levels and weather mean patterns hold up good from week to week. Both September and October are two of the best months of the year for both crappie and bass. Stable weather, calm winds, uncrowded waters, beautiful landscapes as trees change colors.....fall is an excellent time!